James Sprinks, PhD candidate at the Horizon Centre for Doctoral Training and Lead of the Planet Four: Craters Project, explains how members of the public can change our understanding of the planet Mars. 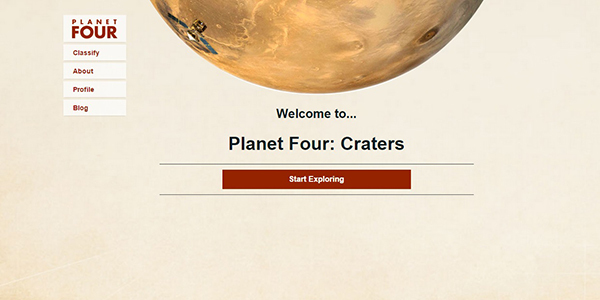 Planet Four: Craters is a citizen science project designed to help planetary scientists identify and measure craters on the surface of Mars. By counting the craters, we will be able to figure out how old various geological surfaces are! This will be a big help for future missions, which will use geophysical techniques such as seismology and heat flow to figure out how Mars has evolved. Knowing the age of the surface will help us to put a time-scale on that evolution. We need help to locate these craters and record their size. They are not difficult to find – sometimes there can be hundreds within one image. There simply aren’t enough scientists to do this work, which is where citizen scientists come in. The features are usually circular and often appear darker than the surrounding plain, where they have puffed away the overlying light surface dust. By counting how many craters are on different surfaces (for example a lava flow or an ancient sea bed), we can figure out when those features were formed. Why are there so many craters on Mars? Unlike the Earth, which has lots of extremely vigorous processes such as tectonics and strong weathering that wipe out impact craters, Mars mostly only has wind erosion and wind-blown dust to bury its craters. The Earth also has a much thicker atmosphere, so meteorites have to be much larger in order to hit the ground, otherwise they will just be burned up on entry. The Martian atmosphere is much thinner than ours, so smaller space rocks can penetrate to the planetary surface. The images on our website come from the CTX (Context) cameras on board the Mars Reconnaissance Orbiter. From 400 kilometres (250 miles) above Mars, CTX takes images spanning 30 kilometres (almost 19 miles) of terrain. The camera has a resolution of 6 meters per pixel, resolving objects about 20m in size. There are far too many images for a group of scientists to get through alone and computers are just no good at detecting the features we are trying to mark. The human mind is far superior at analysing images with the complexity of the Martian surface! Volunteer markings will be collected together with the markings made by other volunteers on that same image. Taking an average of these markings, we will produce a crater density map that can be used for dating the Martian surface. When marking craters on Mars using this new version of Planet Four, volunteers will be using one of three different classification interfaces. They each have different tools to use (on the left hand side of the page), and will ask volunteers to complete tasks in differing orders for each image. Don’t worry! When you use one of these interfaces for the first time a tutorial will guide you through how to use it. The reason for the different interfaces is that we want to know which one works the best, the one that volunteers enjoy using the most and find the easiest to use, and gives the best crater marking results.